View of the back of a purple 'pod' towards the derelict property on The Vennel seen in J5081 : Former Barber's Shop, Bangor. Queen's Parade is to the left. 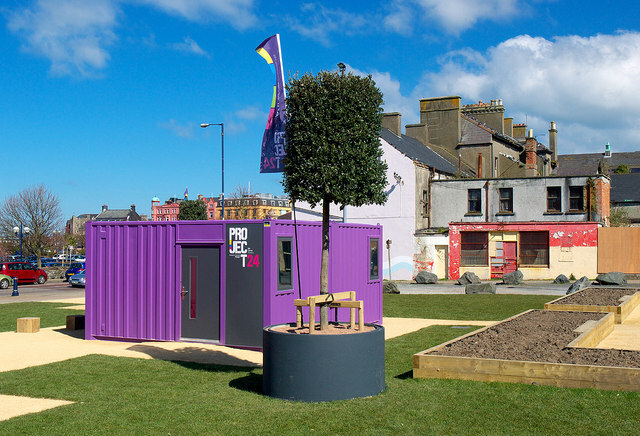 "The Department for Social Development (DSD) has made £250,000 available for a temporary revitalisation project on the Queen’s Parade site, with the aim of strengthening economic regeneration in Bangor. Project 24 will build on the town’s vibrant art and craft scene by creating a new space for artists to work and display their art. *Developing a new community garden, offering local people the opportunity to grow plants and vegetables. The Council will oversee the delivery of Project 24. A design and build team will shortly be appointed and undertake consultation work. Construction on site will begin before the end of the year (subject to Planning Approval) and the project will be launched by Easter 2013." A long term derelict site, on the southern side of Queen’s Parade, overlooking the marina. There have been many plans for its development none of which have even remotely looked like coming to fruition. The following is part of a press release issued by the Department for Social Development on 5 December 2012: “Social Development Minister Nelson McCausland has announced his Department’s intention to take direct control of plans to develop Bangor’s Queen’s Parade Area. . . . The move will see the Department for Social Development (DSD) purchase the land portfolio owned by Karl Greenfarm Properties Limited. Site assembly and the task of obtaining planning permission for the Queen’s Parade scheme will now rest with the Department. DSD will work in partnership with North Down Borough Council and will also be engaging directly with local residents, business owners and all those who have shown an interest in the development plans.. . . . Nelson McCausland said: “This is good news for Bangor. I have decided that my Department will step in to take direct control of plans for the development of the Queen’s Parade area of the town as outlined in the Bangor Town Centre Masterplan. Karl Greenfarm Properties Limited has agreed to sell their land portfolio to the Department to allow for the development of this area. This will drive forward the development of Queen’s Parade and in time it will help breathe life back into the town centre and restore Bangor’s image as a destination town with tourist appeal. This is a prime opportunity site which when developed will improve the economic performance of the town centre.””. This page has been viewed about 98 times.